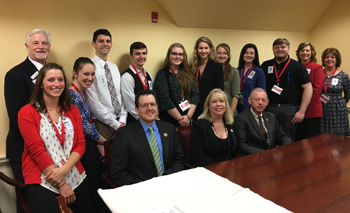 On Feb. 8, Carroll students joined their peers from Maryland community colleges to tell their stories to legislators and garner their continued support. Pictured here are from left to right, back row: Dr. Ball, Amanda DeRose, Garrett Snell, Daniel Mattingly, Ella Breden, Olivia Hare, Molly Klezer, Katelyn Skelton, TJ Finecey, Dr. Rose Mince, Barbara Gregory. Front row: Heather Diehl, Senator Justin Ready, Delegate April Rose, Delegate Haven Shoemaker.